Last weekend I was privileged to attend Kingsford University in fabulous Las Vegas. This was my first time attending, and was it ever a treat! 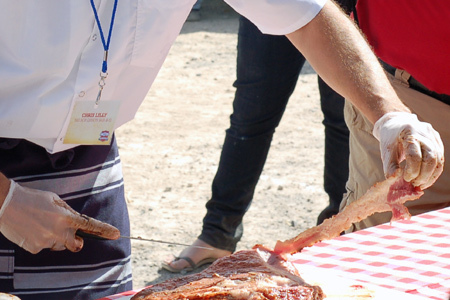 To be able to spend three days as a guest of Kingsford in the company of a legendary champion barbecue cook and other barbecue aficionados is a great honor. Oh, and it was also my first time as a NASCAR race spectator. 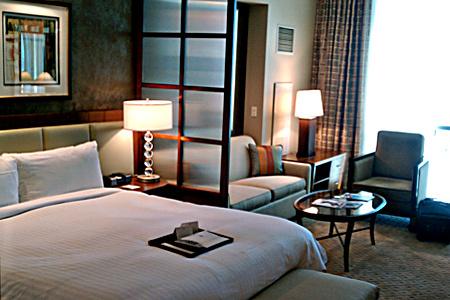 We stayed in suites at The Signature at MGM Grand, and the rooms were great! My suite overlooked the airport and, as an Air Force veteran, that was a great bonus. 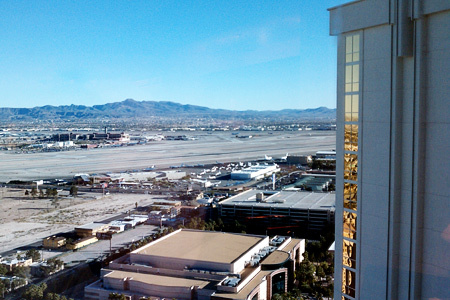 Watching planes take off in silence from 36 stories makes them look like model airplanes. We arrived Friday and they held a welcome dinner that evening at the outstanding Craftsteak restaurant inside the MGM Grand. When I say "dinner", I really mean an extravaganza of food and drink. I lost count of how many dishes we were served, but it included some absolutely incredible steaks and side dishes. Unfortunately, I left the good camera in my room, and the cell shots were just awful. Sorry. Saturday morning we were up bright and early to head to the Las Vegas Motor Speedway for a full day of demonstrations, barbecue, food, and camaraderie. 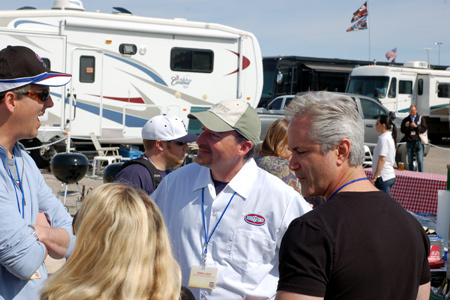 The venue was set-up in the parking lot amid a vast sea of huge RVs and every kind of tailgating rig you can imagine. I heard that there were 180,000 spectators for the race and, based on what I saw in the parking lot, I think every one of them brought an RV. We were right in the thick of the NASCAR tailgating scene. 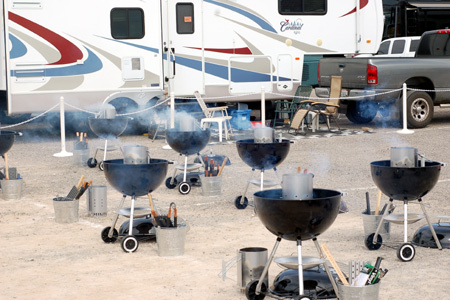 It reminded me of some of my previous barbecue competitions. It was warm, sunny, dusty, smoky, festive, and fun. Our barbecue professor was none other than 10-time world champion pitmaster, Chris Lilly of Big Bob Gibson's Bar-B-Q in Decatur, Alabama. 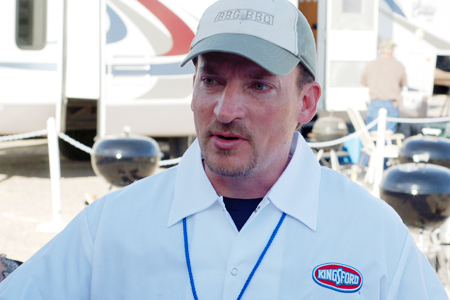 In addition to competition barbecue and running things at the restaurants he also authored Big Bob Gibson's BBQ Book in 2009. If you want to learn from a true professional and gentleman, Chris is your man. Chris kicked off the day by giving us a tour of the pit that he was using for the weekend. 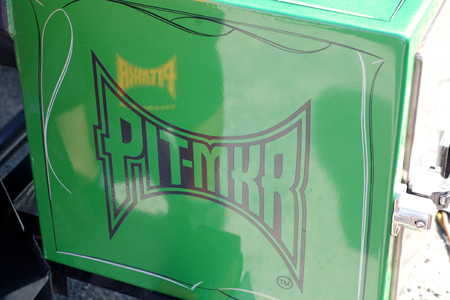 This totally custom pit from Pitmaker in Houston is off-the-chain! 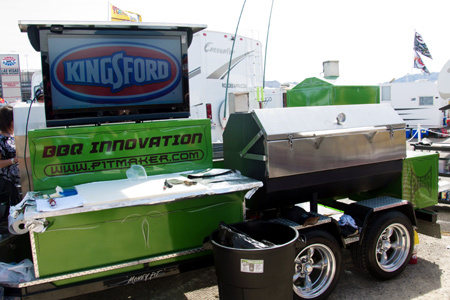 This beast features an offset cooker, vertical smoker vault, huge grill, side burner, storage, and a work surface. Oh, and yes, that is indeed a motorized flat screen TV. 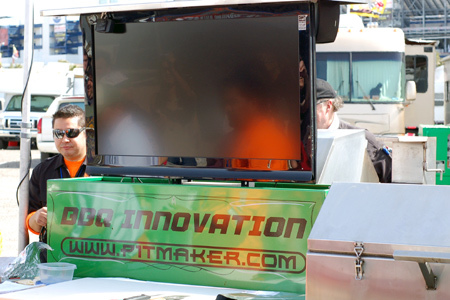 You don't want to miss the race or the game while you're cooking, right? The craftsmanship, fit and finish, attention to detail, and wow factor of this pit are truly outstanding. You can think of it as the Bentley of pits. Pitmakers Victor Howard (left) and George Shore are a couple of nuts that were a blast to hang out with. There's no chance of losing these guys in a crowd. 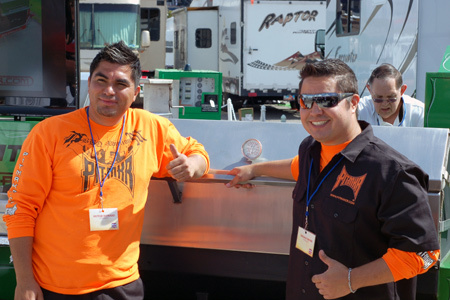 Next Chris gave us a brisket prep demonstration and discussed the process that makes a championship product. His approach is very simple, which I really appreciate. One tip that I've used which works really well is to liberally coat the brisket with a paste of beef base and beef broth before putting the rub on. The paste helps the rub adhere, and it also helps create a great bark and au jus. 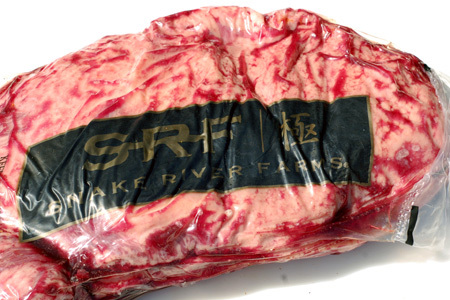 He was using American Wagyu briskets from Snake River Farms. These are all the rage on the competition circuit, and for good reason. The quality is incredible. In part two I cover the rest of day two, which included many more great demos and a ton of food. Man, was that a good time! Look forward to seeing you next round of pics! The back of my head made it into one of those pics!!! Whoo hoo!! Nice tip on the beef base. I want to try that on my next brisket. Looking forward to part 2. Brian - The paste coat really does work well. I add a little Worcestershire sauce and some Gebhardt's chili powder to mine. 1) I love the fact that you say you are a Christian. 2) Love your blog; it is very professional in the way that it is laid out. 3) I really liked this one part about the Kingsford deal. Could you tell me more about that? Do they have it every year and can anyone attend? thanks a lot, and hope to hear more from you. I will definitely be back. Mike - Thanks for your very kind comments. 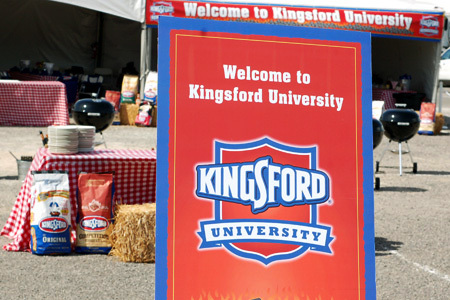 As for Kingsford University, it's an invitation-only event that they have held annually for four years (I think).